“The photo I found has a pencil notation ‘about 1960’ on the back, but the cars look like the ’50s to me. It had to be before the Bank of America building on the corner morphed into the Menlo Theater (and at the same time the old Menlo Theater on El Camino was renamed the Guild Theater). “Old timers remember Searles as like a cafeteria, which is consistent with the sign ‘BUFFET’ in the window. I’ve seen another photo (older, newer?) of these same businesses with ‘Fine Foods’ an integral part of the Searles marquee. 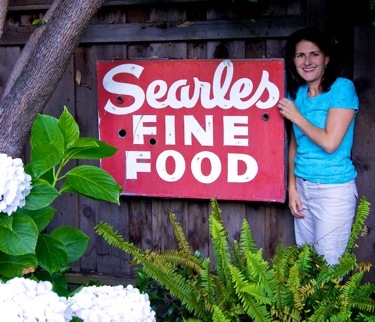 InMenlo photographer Irene Searles adds another chapter to the Searles story, at least as far as the sign is concerned: “A friend, Dianne Child, called me and told me that she had spotted a Searles Fine Food sign at Harvest Furniture. I went to the store and was told the sign had been found in the attic. It was being sold for $100, and, initially, I thought I don’t want to spend the money. Editor’s note: Do you have an anecdote to share about the history of Menlo Park or Atherton? Send to tips [at] inmenlo.com.